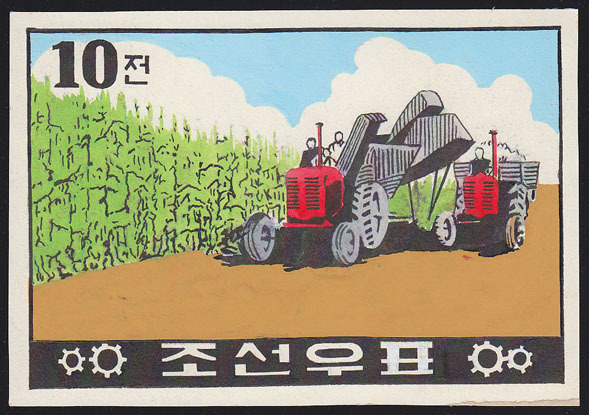 4 MAQ NORTH KOREA (1961) Maize harvester*. Preliminary artwork from the archives of the North Korea printers. Watercolor on posterboard, measuring 11 x 15 cm. 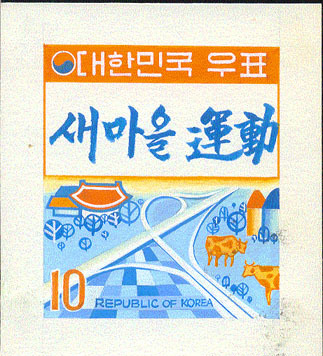 Inscribed on back with official stamp and notes in Korean. Scott No 286, Yvert No 270, KSC No 249. 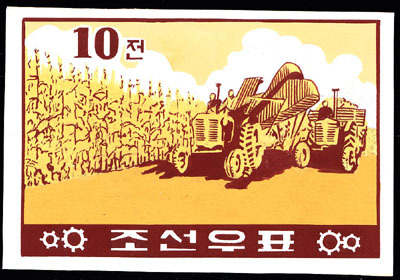 5 MAQ NORTH KOREA (1961) Maize harvester*. Preliminary artwork from the archives of the North Korea printers. Watercolor on posterboard, measuring 16 x 11 cm. Inscribed on back with official stamp and notes in Korean. Scott No 286, Yvert No 270, KSC No 249. 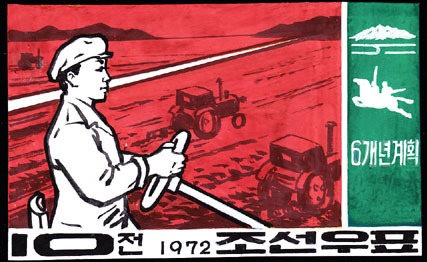 6 MAQ NORTH KOREA (1972) Tractors plowing fields*. Preliminary artwork from the archives of the North Korea printers. Watercolor on posterboard, measuring 17.5 x 10.5 cm. Inscribed on back with official stamp and notes in Korean. Scott No 1066, KSC No 1085. 9024 MAQ SOUTH KOREA (1973) Highway*. Farm*. Unaccepted design in watercolor on carton for definitive issue. 7.8 x 8.6 cm. Mounting adhesions on back. From the archives of the head of the stamp design department. Scott No 645.